Do you find the idea of devising choreography daunting? Some dancers and teachers (Sue Buntine springs to mind!) make it look easy. But behind every finished piece on show there has been careful preparation, a good deal of thought, imagination and visualization, and a lot of trial and error sessions. At a recent class Sue Buntine was demonstrating a method of "dancer's shorthand" as a mode of analyzing music towards choreography, or as an aid to memorizing the intricacies of a particular piece of music for performance purposes. Sue commented that even a professional musically trained dancer will often resort to this method as a way of absorbing the music into memory, and once you have used this method to chart a piece it is possible to rehearse whilst following your chart. 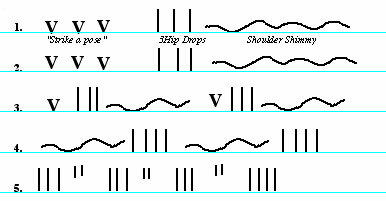 Whilst more experienced dancers may have already used or experimented with this method, beginners and those attempting first choreographies may find this dancer's shorthand a useful tool. The example Sue Buntine used for demonstration purposes and shown here (below) is a piece from cassette "Dancing Drums" by all female drumming group Susu and the Cairo Cats, Side A - "Cleopatra's Frenzy". Strike a pose, 3 hip drops , shoulder shimmy. Take a quarter turn left and repeat etc. Assuming you have this particular cassette, play your tape, and identify the notation and you will quickly grasp the idea. Basically there is no format - it's up to you to jot in a fashion that means something to you personally. In other words the mind picture the musical phraseology means to you. Whilst this method looks easy to this particular piece of music, one can foresee it gets a little more complicated when you have a vocal line running differently from the drum or musical line. I put this question to Sue, and the reply was that you may have to write two lines one above the other, and then in choreography decide to follow one or the other or move between the two. Because of her experience Sue was able to jot rapidly on a blackboard in response to a taped piece as a demonstration for us novices. Believe me it's not that quick when you try it first time. As "home work" I set myself the task of dissecting the Drum Solo Side A of Dancer's Paradise (Raja Zahr), a total of 2minutes 1 second by my stop watch. To save my original tape from possible damage I made a copy, as I knew in advance I'd be doing a lot of rewinding and fast forwarding in order to make a good job of my first attempt at analysis. Nevertheless I got the bare bone of the outlines down on screen fairly quickly, and I can refine from there, and even started to underscore with suggested bellydance moves under my symbols. Then comes the trial and error stage where you might try out the moves in front of a mirror, and refining further with changes of direction and variations in level or height etc to make a polished and presentable dance choreography. ENQUIRIES for Dancing Drums by Susu and the Cairo Cats can be ordered from Maria Masselos who quite often has this very popular cassette/CD in stock.